Coastal Skin & Eye Institute in San Diego, CA isn’t like any other practice you have visited. We have brought together a superstar team of specialized dermatologists, Doctors Christopher Crosby and Maki Goskowicz, and an ophthalmologist, Doctor Michelle Crosby. With impressive credentials and many combined years of experience, they help patients in the beautiful Carmel Valley area enjoy clear vision and healthy, attractive skin. With an average of 263 sun-drenched days each year, skin cancer is a concern. Take advantage of highly-qualified skin cancer screening and advanced treatment options including Mohs micrographic surgery. Our dermatologists provide aesthetic services, too, such as Botox and dermal filler injections and nonsurgical body contouring. San Diego’s sunny climate presents vision challenges, as well. Dr. Michelle Crosby is a Board-certified ophthalmologist, highly skilled in comprehensive vision checks, accurate diagnosis of eye disorders, and effective treatment options. With a licensed optician on staff, you get eyeglasses and sunglasses that look as great as they perform. Coastal Skin & Eye Institute is located in The Merge shopping plaza at 5550 Carmel Mountain Road in San Diego, CA. 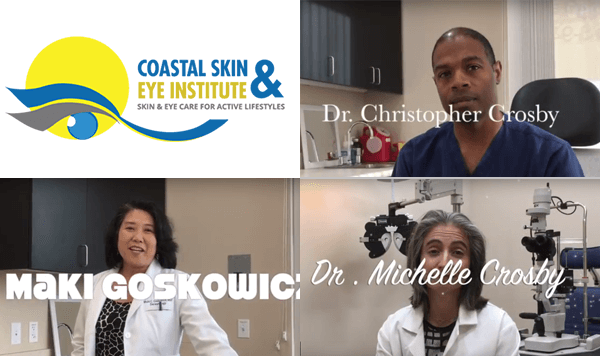 Call (858) 943-2540 or visit www.coastalskineye.com to book an appointment with one of our specialized dermatologists or our ophthalmologist – doctors who care how you see and look.